When it came time during my first marriage to think about having children, I decided in my mind that I wanted all boys. Having grown up a tomboy, and being a hunting and fishing enthusiast – and never a ribbons and bows girlie girl – it just made sense to me that I would be better at – and have more fun – raising sons. 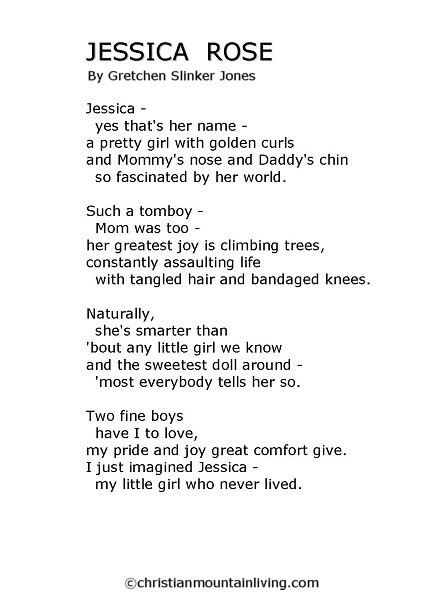 Somewhere along the way, after two handsome and amazing sons were born to me, my poetic heart chose to express some thoughts on what a girl child of mine would have been like, had God had a different idea about the gender of my children. There have been those over the years who have asked me whether Jessica Rose was a miscarried pre-born child, and she was not. She is a wistful figment of my imagination, and only God knows where the poem originated. Had there been a girl child born to me, her name would have been Jessica Rose – the Rose being for my Grandma Rose Hedberg (who was an “adopted” grandmother-of-the-heart and not a relative). Jessica would have been shortened for daily use to Jessy – and she would have been Jessy Rose! Most, if not all, of us have times in our life when things don’t go exactly as we had planned – a relationship that didn’t turn out, a career that didn’t pan out, a friend that ran out when you needed her most – but God’s plans are frequently different than ours. Are you thankful today for where God has you right now? Even if you are caught in a conflict you didn’t ask for, have you told him so? People who know me understand that sometimes unusual thoughts come out of my brain onto paper. My friends also know that I have been known to express fervent opinions on “political” matters. When the news broke that the State of Alaska had decided to limit moose harvest to bulls with 50 inch + rack, I immediately pictured myself on a stepladder, with a cloth tape measure like I use for sewing, scrambling to measure the breadth of the antler while coaxing the rowdy beast to stay still so I could complete my task. And I have to admit that I never hunted moose again. In a scope, in the woods, in the rain – swatting mosquitos and up to your knees in mud – all big antlers look like they’re 50 inches! Maybe that was their aim – no pun intended – to cut down on moose hunting altogether. 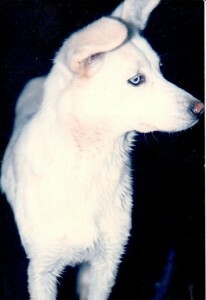 For weeks, I had been watching out the glass doors in the dining room as a squirrel played “tag” with our husky mix, Chinook and our neighbors’ black lab, Buddy. At first, his movements and actions – scampering from tree to tree, scaling the trunks, leaping across seemingly vast spaces (for a squirrel) – seemed random. After several days of observation, however, I concluded that the squirrel was actually teasing the dogs. It was truly fun to watch. The dogs were determined, the squirrel had unlimited time and energy – “the never ending match.” To my knowledge, the dogs never caught up with the squirrel. It ended, as they say, in a draw! Once upon a time … In the late 1970s, my enthusiasm for CB radios led me to meet an amazing couple whose CB handles were the Railroad Man and the Railroad Woman. Over time, they became Grandma and Papa to me, even though we were not biologically related in any way. Grandma and Papa Hedberg were the epitome of “love.” After more than 50 years of marriage, they still smooched when he went out the door to run errands; and they held hands wherever they went. Even though I only lived a little ways away from their modest home, on weekends I would show up at the door and say, “I’ve got a nightgown, have you got a bed?” I often spent the night, with Papa teaching me the intricacies of playing pool (he played billiards for a “living” for awhile after he finished his military service years). When Papa died, it left a big hole in my life and a much bigger one in Grandma’s day to day existence. I never knew for sure if he had a personal relationship with Christ, but God knows; and perhaps I will see him again one fine day. Papa’s ashes were scattered in the area of Swan Falls Dam, where I spent many a weekend fishing for sturgeon long ago and far away. 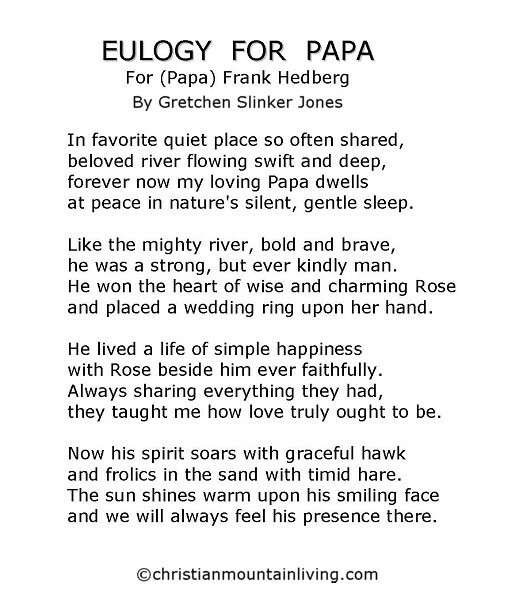 The poem, Eulogy for Papa speaks to my appreciation of both his character and the relationship the two of them shared. It has been more than 35 years since I was last at Swan Falls Dam. It might be near time for a visit. If we’ve lived very long, we’ve gone through trials of one sort or another in our lives. They may involve personal relationships, the loss of a loved one, financial setbacks, or a myriad of other events or occurrences. 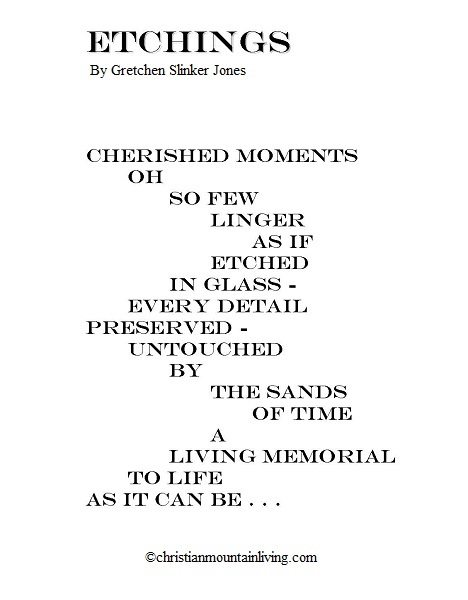 It was during one of those difficult periods in my life that the poem, Etchings, went from thoughts to paper. Please note that God brought me through that trial, as He always does! 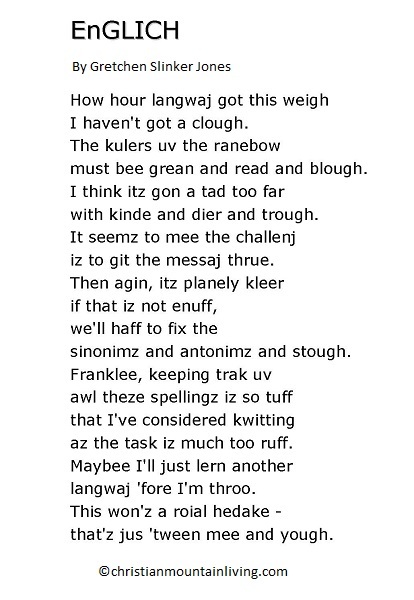 The poem titled, “EnGLICH” was written as a result of an experience tutoring grade-school children when my boys were small. We all have to admit that the English language has more than just a few confusing elements. I just had to have a little fun with it! Not surprisingly, it is easy to read right through the rhyme. Makes you wonder, at least a little, why we bother teaching spelling. However, I am still a stickler for correct spelling, grammar and punctuation. I am not anywhere near ready for correctness in the English language to be a past memory. 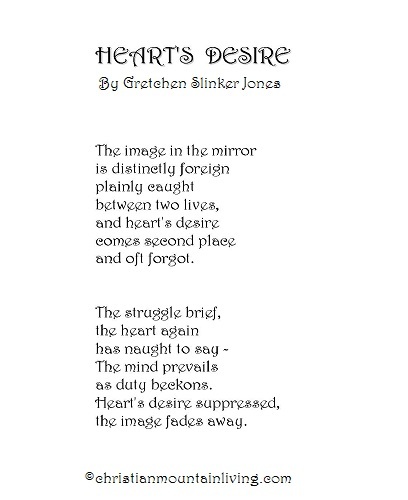 Click on the poem graphic for a link to purchase the book. As I have mentioned in my books, sometimes words just pour forth, title and all. There are occasions when a title comes into my mind – and it could be six months or more before the poem comes along to go with the title. Periodically, a poem literally “writes itself” and I have to come up with a title to go along. 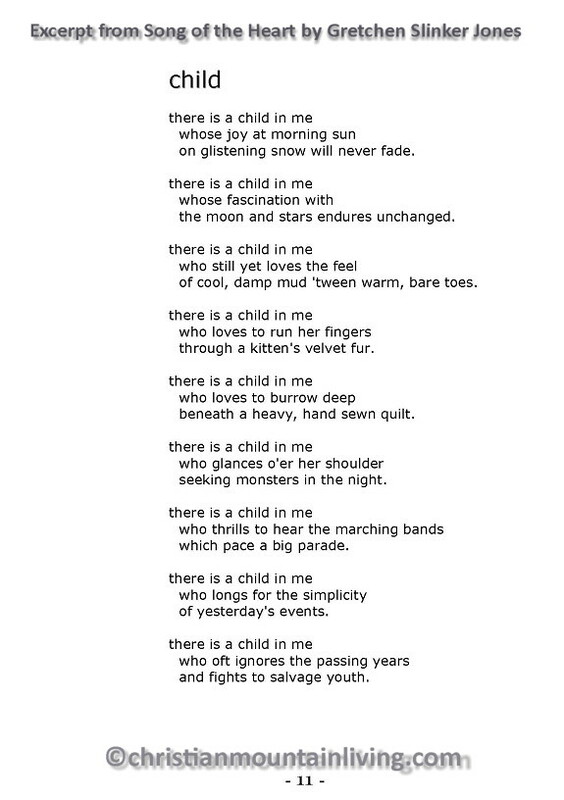 “Child” is one of those works that simply wrote itself. And the title was obvious. 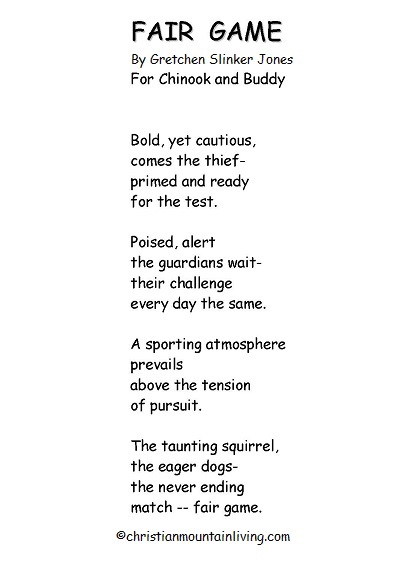 Even today, in my sixth decade of live on planet Earth, the actions mentioned in this poem bring out the inner child in me. 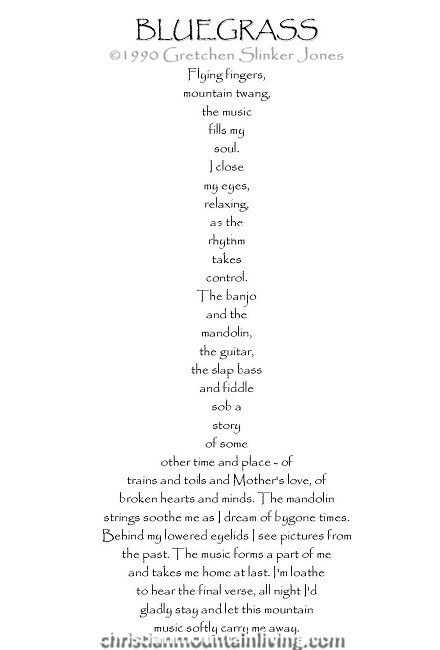 When I wrote the poem titled, “Bluegrass,” I had just come home from a wonderful concert in Kenai, Alaska. As with many of my poems, the words just came pouring out onto the paper. One could easily say, “It practically wrote itself.” The idea of shaping “Bluegrass” like a banjo came later when I actually decided to create and publish a book of my poetry. 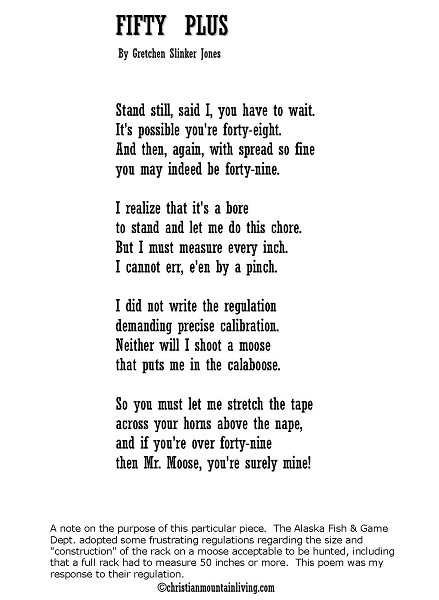 Some time after the poem had been published locally, an individual commented to me that “mountain music” and “bluegrass” are not the same. I understand this concept. I guess you could say that I employed a bit of “poetic license” in the writing. What works, works! 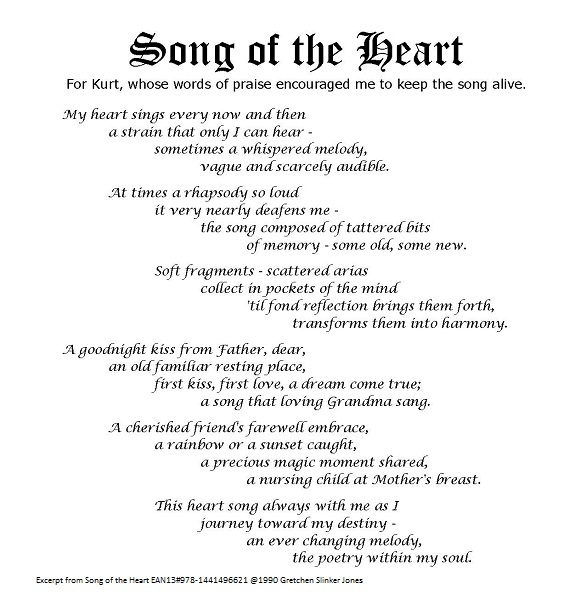 As I begin this new series using the poems from my all-inclusive volume, Song of the Heart – The Complete Collection, I will give a bit of a “story” with each poem to give the reader an idea of how the poem came to be. This first series will be from Song of the Heart – Volume 1 – Heart’s Desire. In the late 1980s, our local newspaper in Alaska began a column called “Poetspeak,” with a request for local poets to submit their works for consideration for the column. Kurt Kristensen served as “editor” and his wife, Linda, sketched original illustrations for each poem. 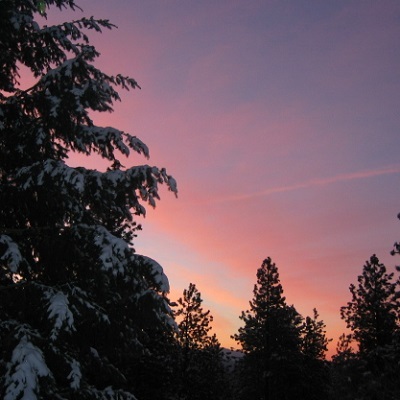 Kenay Sunset was the first poem I submitted for publication. I still have the original newspaper clippings of the first several poems I submitted and Linda illustrated. 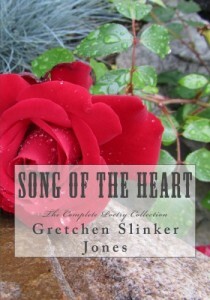 The first poem I will include in this new blog category is the title poem of the series.